It sounds crazy, but imagine waking up one day in your 40’s with allergy symptoms. You look around your house for the culprit. Maybe it’s the houseplants or maybe you left a window open. You’ve always kept your cat and dog in the house without a problem so you know the symptoms aren’t from your pets. Or are they? If this sounds familiar, you’re not alone. 10 percent of Americans are allergic to household pets and cats are 2x more likely to cause allergies than other indoor pets (source). Like other allergies, those caused by pets are on the rise! Interestingly, pet allergies can develop later in life. In fact, they can develop at any time and allergies can even vanish on their own too. In the sections below, I’ll share my experience with pet allergies and the reactions I began getting at age 30. We will also discuss what can cause allergies later in life and what you can do to find relief. A few years ago, at the age of 30, I began feeling itchy after being around dogs and cats (especially cats). I remember visiting a friend’s house and seeing pet hair on the couches and carpet. I thought nothing of it until I made it home later the same day. I began to itch and broke out in hives. My reactions were delayed so I wasn’t sure the exact reason for my symptoms. Also, I didn’t sneeze or have a stuffy nose, so I wasn’t experiencing the typical symptoms you’d expect with allergy. A few weeks later I visited my aunt and stayed the night at her house. The house was full of cats and dogs. The next morning I woke up with hives all over my body. It was obvious: I was allergic to pets and was experiencing symptoms that I never had growing up. 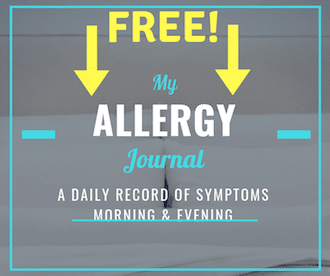 I grew up with dogs and had never experienced allergy symptoms. Nor had I felt different when I visited friends and family members had cats. I thought to myself, “What is going on with my immune system?”. Why was I reacting to all these harmless things in my environment? Could I have developed allergies later in life? It’s important to note that most people will develop allergies as children or as young adults in their early 20s. It is rare for older adults to develop new allergies, however, it’s not impossible. According to immunologist Kanao Otsu (National Jewish Health), most adult allergies will have existed in the individual as a child, however, the symptoms may have been minor. After speaking with my allergist, I understood that I likely had pet allergies when I was young. At an early age, my body was resilient enough that I may not have noticed the symptoms. Over time the symptoms became stronger because the allergies weren’t addressed. During my life, I’ve moved a lot for work so I’ve gone from dry arid environments to lush tropical environments. My body has worked to adjust to new areas and differing levels of allergens. I’ve also lived in stressful environments and taken high amounts of antibiotics due to the work I’ve done. These may or may not have affected my allergies, however, stress, antibiotics, pregnancies, and major lifestyle changes will have a profound effect on your body, especially the immune system. According to Dr. Clifford Bassett, an allergy and asthma specialist and Medical Director of Allergy and Asthma Care of New York, the color and gender of your cat could play a major role in your allergies (source). In his research, he found that darker colored cats are more likely to cause allergic symptoms than light-colored cats. In addition, female cats produce less pet allergen than their male counterparts. Developing an allergy to pets can be discouraging, however, there are a number of ways you can reduce your exposure to pet allergens in the house. I understand you won’t want to be separated from your pets, but you can control which rooms they are allowed to go into. It’s as simple as shutting your bedroom door and it could improve your sleep (my favorite allergy-proof bedding). Most people believe than allergy bedding is for dust mites, but allergy bedding does a great job of keeping pet allergens out of your mattress and pillows. Over time, pet hair and dander will find their way into your bedding where they can cause allergy symptoms for years. Allergen-proof covers will keep them out, and trap allergens inside (if you’re using an old mattress or pillow) and away from your skin/airways. A trip to the home improvement store won’t provide you with good allergy protection. To find the best options for allergy, you’ll need to look online. 3M and Nordic Pure make filters that will trap cat, dust mite, and pollen allergens, as well as bacteria and odors (my ranking of best furnace filters for allergies). I turn my HVAC vent on 1x each day and it helps filter most of the air in my house. Allergy filters need to be changed more frequently (1x every 8 weeks depending on its use), however, regular use will help reduce dust and allergens in the home, making it easier to breathe. High Efficiency Particulate Arrestance, or HEPA filters, are important for anyone with indoor allergens. HEPA filters are will remove 99.97% of microparticulates fro the air and virtually all allergens. An air purifier is meant to run continuously in your home, where it can clean the air multiple times per day (my recommendations for quality air purifiers for allergies). A HEPA vacuum will help with cleaning and is especially important if you have carpets. Regular vacuums don’t have small enough filters to capture allergens and end up blowing dust around the house – they make allergies worse! Yes, I know this won’t be popular, however, it’s still an option. Depending on how bad your allergies are, you might need to keep your pets outside. For some people, pet allergy can cause asthma and other life-threatening problems and the house should be kept extra clean. Allergy shots or drops are something I’ve used for the past 5 years. The process is administered by a board-certified allergist and involves regular shots, or drops, of the things you’re allergic to. Over time, the allergen in the shots/drops is built up and your body realizes that the substances are harmless and stops reacting to them (sounds simple, right?). If you’re highly allergic to your pets, but refuse to put them outside, or give them away, then allergy shots might be the best solution (my personal experience with allergy shots). They require time and money, but over time, most people will spend less money on over-the-counter medicine like nasal sprays and antihistamine pills. Can pet allergies develop later in life? You bet they can, but more than likely, your allergies have just become worse over time. After speaking with my doctor, I learned I likely had minor pet allergies as a kid and my reactions became stronger over time. I learned what I could do to keep my pets and live with pet allergy and the lifestyle changes I made weren’t a hassle. I paid close attention to my bed and kept pets out of the room. I also invested in allergy-proof covers for my bed. I made the switch from cheap furnace filters to high-quality filters and also installed an air purifier in the corner of my bedroom. If you feel your pet allergies have developed later in life, consider these changes in your home environment. If you need more help and have good insurance, try allergy shots. Allergy shots (subcutaneous immunotherapy) is the closest thing to a cure for allergies and it can significantly reduce your allergy reactions for pets (or eliminate them all together). Allergy shots are a time commitment so most people won’t want to go through the process unless they are really suffering. Thanks for reading another Dust Mite Solutions blog post. 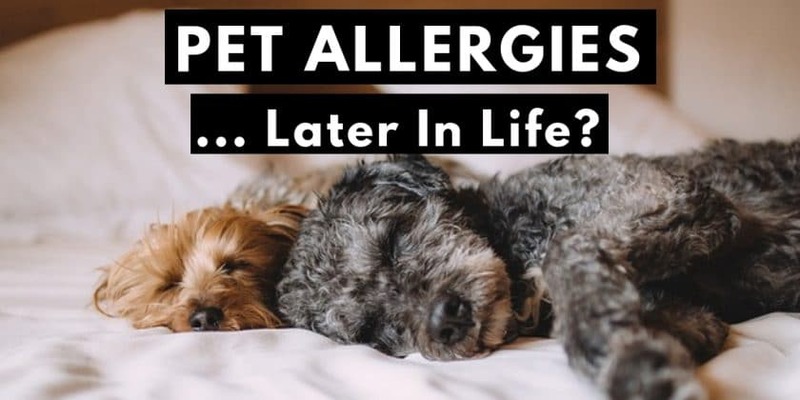 Let us know in the comments if you developed pet allergies later in life.